September came once again, and with it came the Headbanger's Ball Tour. 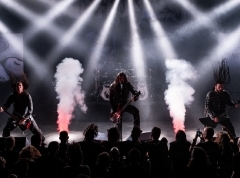 True to tradition the tour acted as a promotional tool for the bands featured on the tour; Mercenary are still promoting their recent "Metamorphosis" album, the same could be said about Artillery and their "My Blood" album, and Hatesphere's new album "The Great Bludgeoning" was released in most of Europe during the days before this event, and it was to be released in Denmark the week after. Marika (MH), our friends and the undersigned attended both the Århus and Herning gig, but while the crowd was significantly different both in size and demeanor, the concerts were very similar. Mercenary received a lot of playtime on my speakers a couple of years ago. 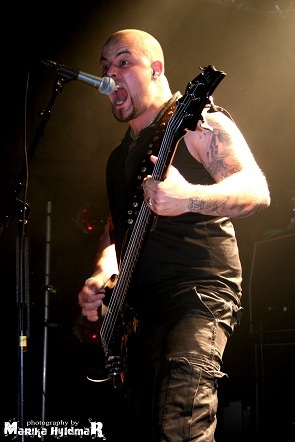 I discovered them shortly after "The Hours That Remain" was released in 2006, and I was there in the crowd when René Pedersen was recruited as bassist and co-vocalist. Now, I'm not going to bash a band's performance because of the setlist, but I simply have to get this off my chest: we're talking about a band who recently released their sixth album, and 6 of the 8 songs played in both Århus and Herning were from that latest album, 2011's "Metamorphosis". Yes, you read that correctly. That's practically shitting on the old fans, because one of the two "old" songs played was from 2008's "Architect of Lies" on which René was co-vocalist. If you change your sound significantly on your new album and then refuse to play the old songs, what's left of the old band? There is indeed very little Mercenary left in 2011, so I say: why settle for a change of logo when you could change the name? This is about the show though, so let's get back to business. René and co. have become seasoned performers, a fact that was evident at both the Århus and Herning show. The guitarists are active on stage almost at all times whether we're talking headbanging, turning their attention towards the audience or just putting all they've got into playing their riffs. But René is the center of attention. As his gaze passes from person to person, you can't shake the feeling that René was born to be the frontfigure of his own band. His stage presence and persona is dominant at all times. As he goes from clean vocals to growls, his facial expressions change as well. Between songs René makes sure that the crowd is with him at all times, and time is spent on encouraging activity. In Århus the crowd didn't react a whole lot, but that didn't affect the band the slightest. In Herning, however, there were plenty of "Metamorphosis"-fans, and their reaction was fantastic. They sang along, moshed and headbanged to the best of their abilities. As the final song the band played "Firesoul", one Mercenary's legendary hits. Even though it sounded ridiculously wrong with René's vocals, the frontman accomplished getting almost everyone in the back to move to the front. Although I will always miss the old Mercenary shows and will never get into the new material, credit must be given where credit is due. As with the other bands playing Headbanger's Ball this year, I've lost count of the number of times I've seen Artillery since their reformation. Maybe I've just gotten too used to seeing the old-timers, but I've noticed a slow but steady decline in the quality of Artillery's live shows, a decline that appears to be proportional to the increase in self-esteem that Artillery bring on stage. Singer Søren Adamsen has gone from being proud of playing with the mighty Artillery to also being an integral part of the band, and thus some of the intensity of his performance has been lost to make room for a demeanor that is best explained as "routine". With bassist Peter Thorslund and co-lead guitarist Morten Stützer delivering stand-still performances time and time again it is up to Morten's brother Michael Stützer to bring the fun to the performance, but even the fun brother has lost some of the magical energy that he used to have. In comparison to Mercenary's awful setlist, Artillery did their best to satisfy everyone while still leaving room to promote their latest album, and as such only just under half of the setlist consisted of songs from "My Blood". Therefore there were room for recent crowd favorites "10000 Devils" and "When Death Comes" as well as some of their legendary late 80's and early 90's hits like "The Challenge", "Terror Squad", "Khomaniac" and, naturally, "By Inheritance". The result was an approved performance that entertained most fans of the band but did little to attract new fans. Artillery can do, and have done better, and I hope they return to form in the near future. The headliners of the tour is another band that I've seen numerous times before. 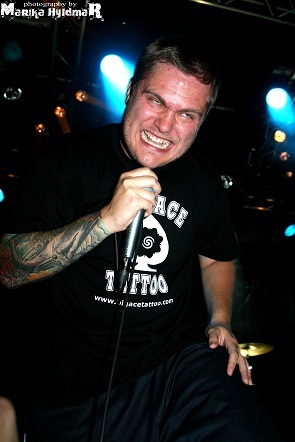 Hatesphere have never disappointed me in the past, and I don't think they are even capable of committing such a feat. The two Headbanger's Ball shows this year marked the third and fourth time we (MH and I) saw Hatesphere with new vocalist Esben "Esse" Hansen, it marked the first time we saw the new bassist Jimmy Nedergaard (also of Gob Squad) and the first time I get to review my favorite Danish band. Continuing the setlist-theme of this review, Hatesphere were the absolute winners in that department. The band played songs from every single album, and only a couple of new songs from "The Great Bludgeoning" were played but still enough to get fans interested in the new album. They even opened the set with an old song. 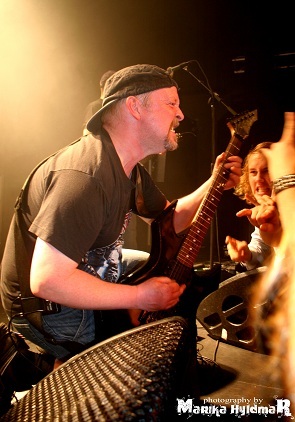 Despite all the turmoil in the band with especially bassists and singers joining and leaving the band every few years, lead guitarist and sole remaining original member Peter "Pepe" Lyse Hansen has accomplished the impossible in keeping the band intact through the last couple of years. 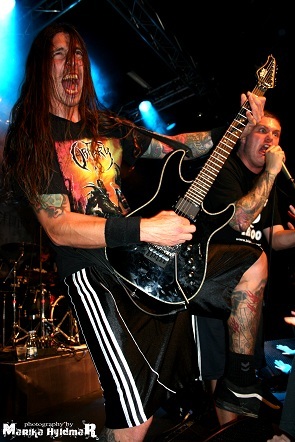 Watching Hatesphere live in 2011 is like witnessing a miracle as each new band member fits in with the rest of the band as perfectly as the last member who left, especially the new singer Esse (ex-As We Fight, Numbnuts) who not only fills Jonathan "Joller" Albrechtsen's shoes but even surpasses the former vocalist's stage performance. Esse has a much more laid back and professional persona on stage and he makes sure that no one is left out of the fun as he wanders around the stage changing from a huge grin to an overdone Immortal-style grim face and makes sure to turn his attention to every single person in the front row. And when Esse is visiting the opposite side from where a certain person might be standing, rhythm guitarist Jakob Nyholm and especially the aforementioned Pepe are always a blast to watch at a Hatesphere show. From start to finish, through 10 years of Hatesphere records and after many a Wall of Death and karate moshing idiots who think that Hatesphere is metalcore and the 10 centimeters of space between me and the person beside me at the front row was enough space for 4 people to mosh in, Hatesphere did what they do best - again.